Two records in one year! Thanks for keeping me entertained and keeping my anticipation time between records to a minimum. A music lover can't ask for much more than that. Do people even write fan letters anymore? Do they request 8"X10" autographed pictures or do they just download everything? Do artists even have pictures anymore? Well here is Max Johnson's picture, his snapshot of three men in a room making music, and as with any great composed shot, here would be his law of thirds for creating a great image. First Law: Max Johnson (bass) has the ability to search out the best musicians to suit his current project. Ziv Ravitz (drums), drawing from his Israeli roots, contributes not only a solid and earthy foundation for the others to play over but also provides just enough world music flavor without making it old or tired. Listen to the beginning of "The Chirps of Imaginary Birds" to get a taste of what I mean. Rounding out the trio is Kirk Knuffke (cornet), who not only writes a great track for the album ("Meta Analytical Procedures for Social Research"), but also takes Johnson's melodies and arrangements and transports them from the ground, past the weeds and straight to the fruit on top of all the vegetation. His playing on "Money, Money, Money" is fantastic. 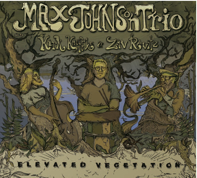 Second Law: Johnson constantly displays his ability to maintain all of the rhythmic qualities needed in a trio setting but can switch gears to push the melody. Regardless of what is happening in the track, your ear will find its way back to the bass somehow. On the opening track "Blue Willie", he keeps the time under the cornet yet seamlessly finds a way to either finish, start and interject the melody in unison with Knuffke. Third Law: He is always changing. Very little here sounds the same as his quartet record from earlier this year. I admit, I was expecting the same, but was forced once again to question what it is I like. Now I can't turn it off. Tracks like "Crackdown" and "Many Celebrations" are germinating seeds that get under your skin, just waiting for you to add your own water and sunlight. So there you have it. I am a fan, hoping that music of this calibre will continue into 2013. Buy it from his Bandcamp page or anywhere else you can find it. Here is what I mean about "Many Celebrations". I adore Kirk Knuffke's cornet playing,which reminds me of Ron Miles whose Monette cornet he borrows. He can play beautiful straight ahead (Orange Was The Color) or wonderfully free (The Exterminating Angel) with equal skill and conviction -- great stuff! Thanks for the kind words Mr. Coombs!